The Hall County Library System in Gainesville, Georgia serves a diverse community, with over 28% of the population Hispanic. The library system has made it a priority to better serve the county’s diverse community, as well as to provide more outreach services, especially in the eastern part of the county where the East Hall Branch had been closed due to budget cuts. Allysa reviewing the children’s Spanish books with me. Photo by Deborah Hakes with GPLS. HCLS received a generous grant from Dollar General to hire two bilingual interns to help during the 2018 Summer Reading Program. Their work would mainly focus on helping develop better library services to Hispanic youth and families. In addition, they would help assist at the summer pop up library and programs at the East Hall Community Center. One intern worked 16 hours a week in June and the second intern worked in July. Rising junior, Alyssa Ramos and rising senior, Doris Toledo were selected out of several applications. 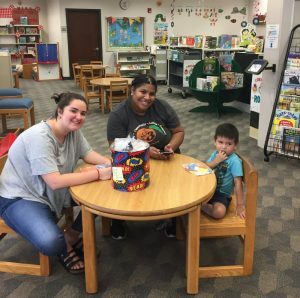 The first week of the summer reading program, Alyssa Ramos helped sign up patrons for library cards and the summer reading program at the Hispanic Alliance’s Health Fair. Alyssa and Doris also helped translate into Spanish new library marketing materials and community services information. Alyssa and Doris spent a great deal of time interacting with families through drop in craft programs. Alyssa designed a felt fish craft using popsicle sticks, glitter and felt. Doris helped plan a Dia De Los Muertos for November and Posadas Holiday craft in December. She also hosted various drop in craft days in July. Doris with a patron and his mom doing a craft. Alyssa and Doris also learned the vital librarian skill of weeding. They both spent a few hours each week assisting the staff going through the collection. Alyssa started by weeding the Spanish children’s collection. She found several popular titles with poor and incorrect translations. The staff were able to pull these poorly translated titles and order correct versions. 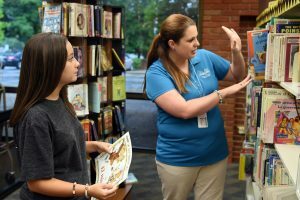 Both interns assisted Spanish speaking patrons this summer in using library services. Several patrons held library cards, but they did not know how to renew their cards. Alyssa was able to explain the updated process to several patrons at outreach events and the health fair. Doris assisted staff members in explaining to patrons how to return or renew items they checked out from the library. They also gave input to the library’s marketing committee on how to better reach and market library services to Hispanic youth and families. HCLS learned from the teen interns working with local Hispanic businesses is a great way to do outreach in our Hispanic community in the area. The library system planned three pop up library days and performances in order to bring books and summer reading to the area of the county greatly affected by the closing of the East Hall Branch Library. Alyssa and Doris helped with the set and up and take down of the pop up library, checked out materials, and signed up kids for the summer reading program. They also helped with crowd control at these summer performances. Because of their work at the East Hall Pop Up Library, over 170 patrons received library services in June and July 2018 who didn’t have access to a library close by. The internship process made me realize how much wealth of knowledge and assistance teens in different parts of the community can provide. Libraries are usually directed to connect with local leaders and school officials to make inroads; however, I have learned your youth patrons have just as much insight and knowledge. If you see an area or demographic in your community that you need better served, seek out teen volunteers and/or interns who can help you. Adrianne Junius is the Youth Services Director of the Hall County Library System. Adrianne received a bachelor’s degree from the University of Georgia and earned her MLS from the University of Maryland. She is a 2006 graduate of the PINNACLE Leadership Institute. She lives with her husband and two children in North Georgia. When she is not at the library or reading, she is cheering on her Georgia Bulldawgs or planning another Disney trip.